Are you considering water leak detection as a business opportunity? Based on experience, you’ve chosen a profitable business to get involved in… but it can depend on what type of detection you get involved with. The good news is that when a home owner has a leak, they can’t wait around to get it fixed (it’s urgent in most cases), so they tend to make a decision on the spot if you persuade them correctly to use your services. We offer a guarantee that gets them saying “yes” every time to our services. You can read about this by clicking on the eBook outlined to the right of this message. For example, we have found the finding leaks underground isn’t as profitable as other application, and very time consuming if you aren’t a plumber. There is more involved then just waving the ultrasonic leak detector equipment over the ground… you need to trace the pipe, possibly dig up the ground etc. We have been able to command more money by having a thermal imaging camera to detect leaks inside houses such as deck, flat roof, bathroom and behind walls etc. 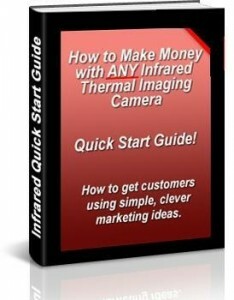 If you have a website that shows infrared images of your work, then people will call you to use your services because they can ‘see’ what you are charging for. In saying all the above, go with niche that applies most to your background when getting started, then diversify from there.